Johannesburg - South African mountain-bike ace Burry Stander says he and Olympic team-mate Philip Buys are in fine form ahead of the London Games. Stander defended his national cross country title at Mankele MTB Park outside Nelspruit at the weekend, crossing the line one minute, 35 seconds ahead of Buys who finished second. The duo will turn out in the World Cup event in France on Sunday, with Stander looking to clinch the series title ahead of the Olympics. "I rode really well with no incidents and the racing with Phil was really good," Stander said in a statement on Monday. "We are both in great shape for this weekend's World Cup in France." 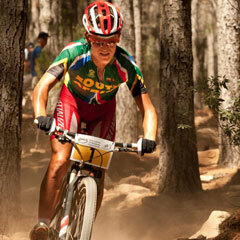 Candice Neethling, who will also compete at the London Games, finished second in the elite women's race behind defending national champion Yolande Speedy. Neethling crossed the line two seconds behind Speedy in a tight contest. "I wish Candice everything of the best going forward to the Olympics," Speedy said.